You asked for it and I have listened! I am thrilled to announce that there are now photos of the outfit that you are making on my printed Doll Clothes Patterns instructions that accompany the doll clothes pattern pieces. I must thank those of you who have taken the time to email me and suggest that these photos be included. It is such an obvious think to do but something I had not thought about when first developing my patterns and instructions as I was concentrating more on the video instructions. I understand how having these photos on the printed instructions makes it much easier to identify the patterns when sorting through the expansive stash of patterns we all have. It is great to receive your feedback because it is from these suggestions that I am able to make improvements to my products. 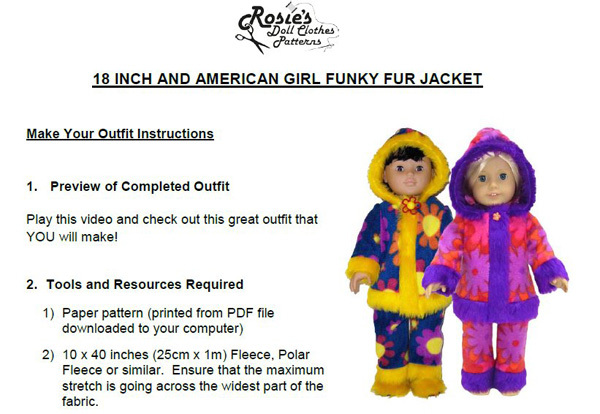 We are currently in the process of making some other important changes to the Rosie’s Doll Clothes Patterns website and will let you know as soon as they have been completed. In the mean time check out my awesome range of Doll Clothes Patterns that come with complete step by step video tutorials. I’ve been away for awhile ( no computer access in the Northern Flinders Ranges) and am just catching up with things…the photo on the instruction sheet is a terrific idea…I’m always sorting out which sheets go with which. Thank you. A pleasure Cherrylmaree. You may also find my blog entry on ‘How to keep your Doll Clothes Sewing Patterns Organised’ helpful too!